Ceilings are an often overlooked design element of a room, but they have a lot of awe-inducing potential. 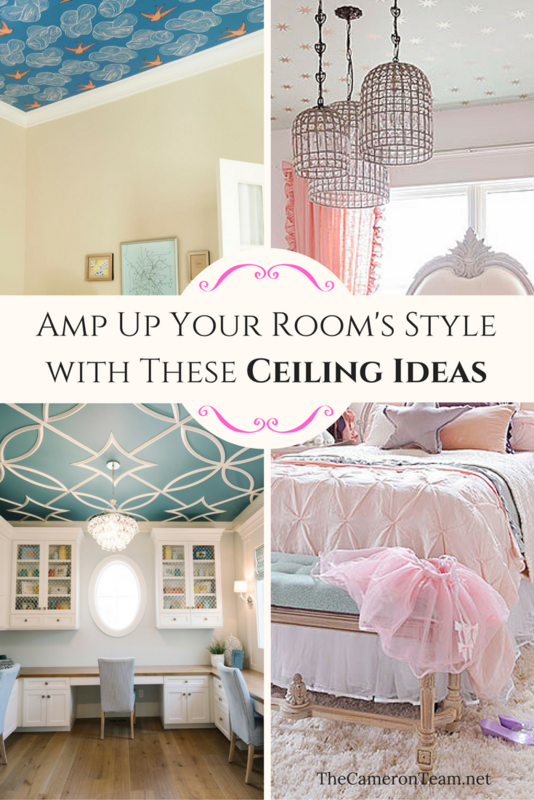 If you’re looking for a way to amp up a room’s style, you may just want to look up. We’ve compiled some of our favorite examples of design inspiring ceilings so you can get your creative mind working. Trey and coffered ceilings are sometimes used in open floorplans to set one room apart from the others. 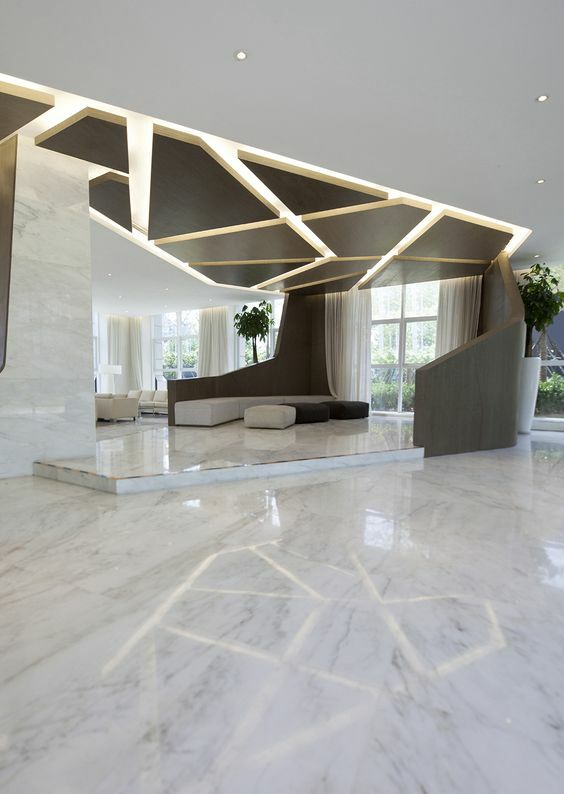 Now here’s a different approach to that – a geometric ceiling. This technique, which has been executed by Robart Interiors, breaks up the ceiling like puzzle pieces and backlights them to create a beautiful art piece that also divides up the open room. The ceiling displayed here covers a sitting area. LED lights can be a fun way to spruce up a ceiling, because they come in a variety of colors and cost very little to run. This ceiling in particular was made for a futuristic movie theater that was featured on HGTV. 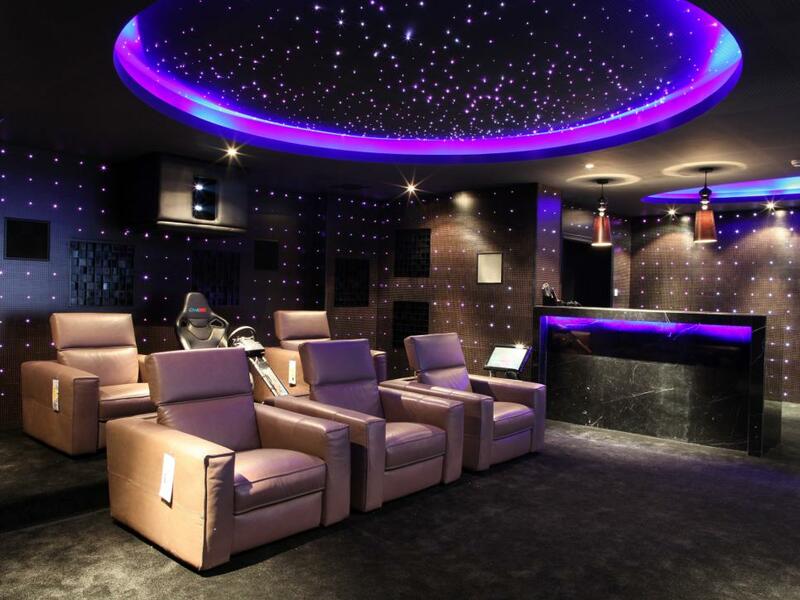 The designer used violet lights in a ring around the recessed area, as well as in a space pattern inside, which gives off a lovely amount of light that’s just perfect for viewing movies. A less obvious way for colored lights to be used can be seen below. 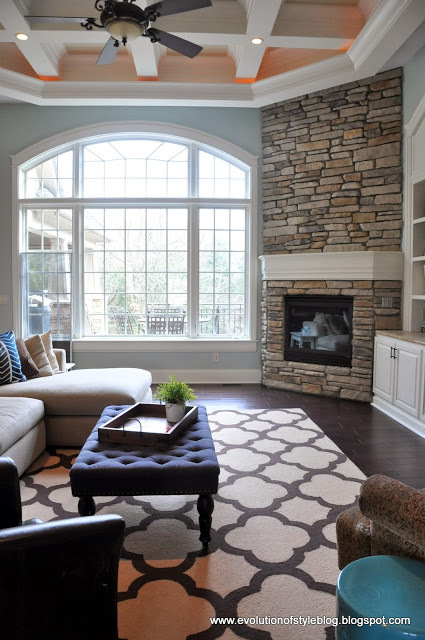 This room was originally shared in our 12 Breathtaking Fireplaces post, but can you see why we wanted to share it here? This room is made up of mainly neutral colors, but the homeowners decided to add a touch of color with orange recessed lighting that shines upward on the coffered ceiling. This is one way to bring more color into a room without it being overwhelming. Molding can be a great way to add some architectural details to a usually boring ceiling. Peter Shelton and Lee F. Mindel did just that when they made over this apartment featured on Architectural Digest. The key to doing this successfully is having an isolated space that can be equally divided up into a symmetrical pattern. 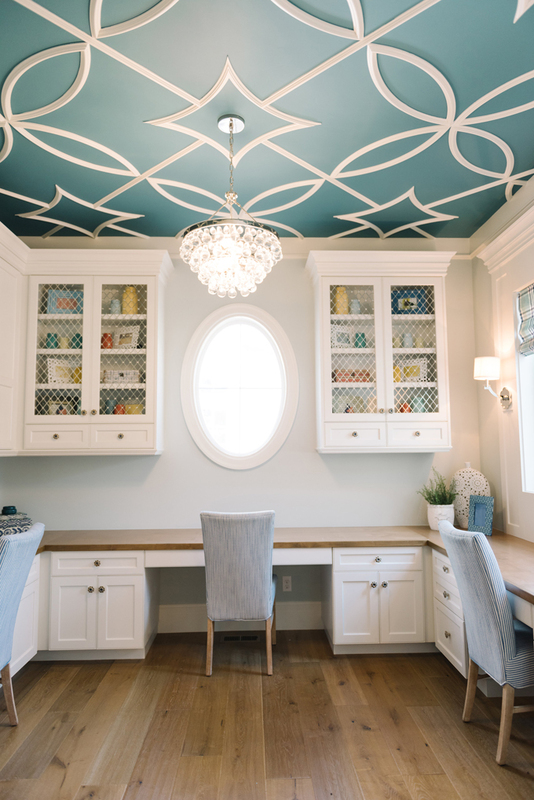 For another example of ceiling molding, take a look at this home office from Lindy Allen of Four Chairs Furniture and builder Davies Development that was featured on House of Turquoise. This white on turquoise floral design adds a beautiful feminine touch. 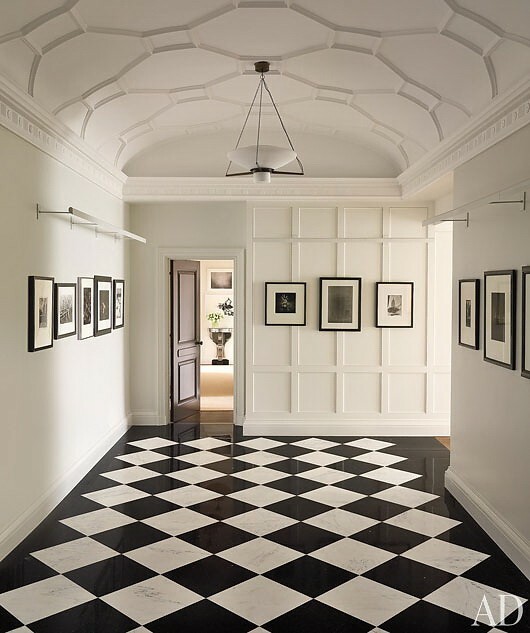 Usually coffered ceilings stretch across the major expanse of a room in a series of sunken panels linked one to the other, but sometimes all you need is a touch of coffer. One panel can create a nice focal point for a small room, especially if you add a touch of color, just like this foyer featured on House of Turquoise. One coffer at the center of the ceiling draws your eye upward while corner coffers balance out the design. 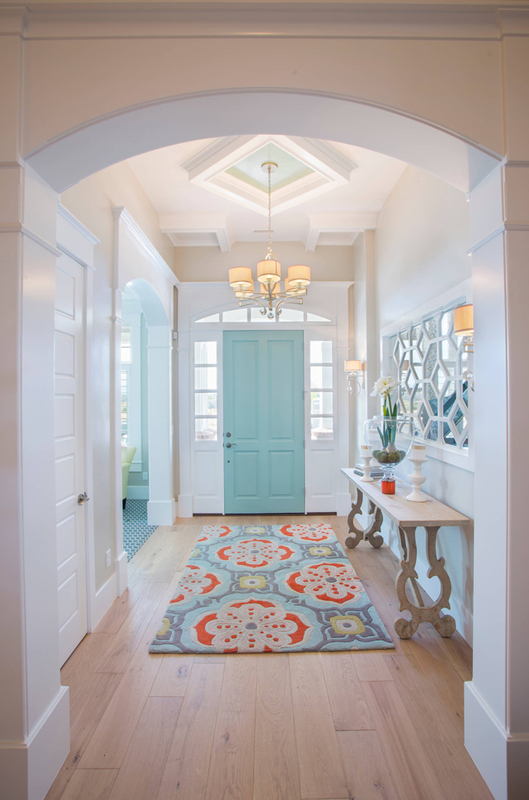 A bit of turquoise paint and a matching rug brings it all together. To add some dimension to a room, all you need is a can of paint! Just be careful about which colors you choose. The wrong color palette can turn a fun design into a circus tent. 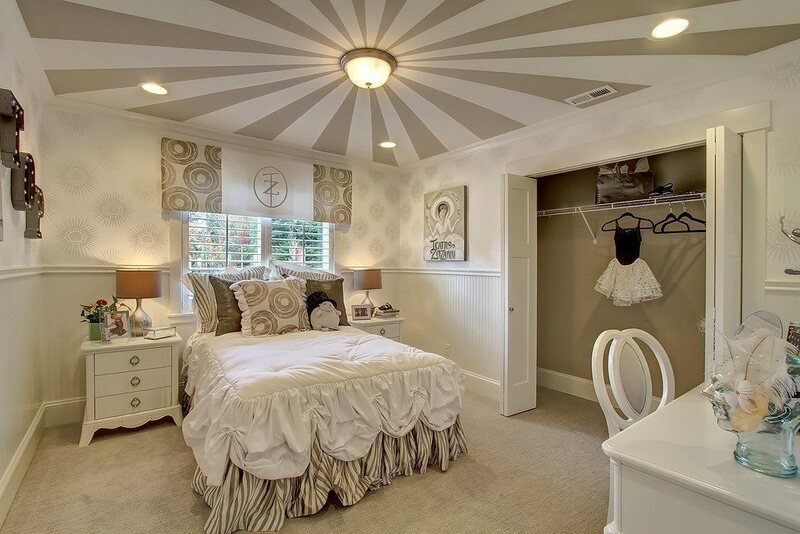 Just take a look at this teen bedroom from the Toll Brothers. The sunburst design on the ceiling works, because it was done in neutral colors. If it had been done in red, it would have quickly turned into a ceiling fail…unless, of course, the theme of the room was supposed to be the circus. To create something beautiful, you don’t need to paint a pattern or an elaborate mural on your ceiling. Sometimes, you just need a bold color and a bit of courage to color outside the lines. 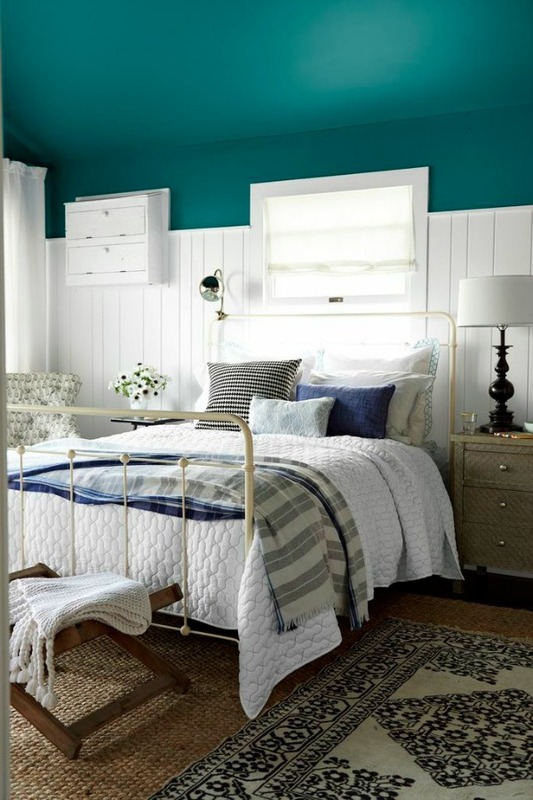 For example, Country Living’s House of the Year in 2013 featured a bedroom where a bold turquoise color was used on the ceiling and upper walls. This created a cozy oasis for the home owners. Due to the pain of installation and removal, most people avoid wallpaper, but it can be a good alternative if you want to add design and texture to your ceilings. After all, not everyone has the artistic gift or stamina to paint a mural. We just don’t recommend installing it yourself if you’ve never installed wallpaper. This sparkly star wallpaper featured on Better Homes and Gardens is one example of how wallpaper can amp up a room’s style. It adds a bit of depth and fun to this teen bedroom. HGTV has another good example of how a whimsical wallpaper can insert personality and color into a normally neutral room. They also share how it was applied. Of course, there are much more bold and realistic style wallpapers to choose from. If you’re building a custom home, here’s your chance to create something really special. Barrel vault ceilings radiate an old-world feel you can only experience in churches and wine cellars. 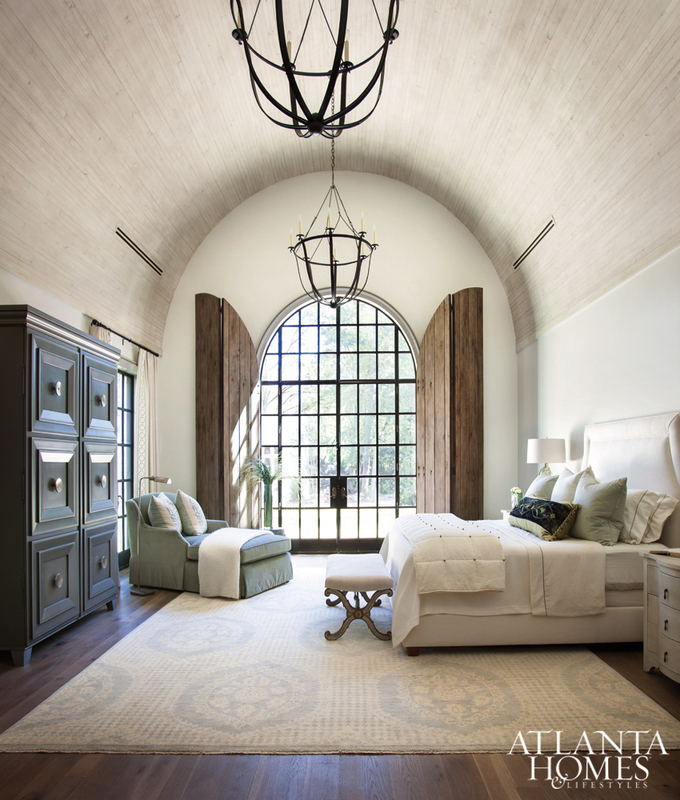 This 18-foot barrel-vault ceiling featured on Atlanta Homes Magazine is the perfect example of how this rounded design can make a room airy, cheerful, and romantic. Want to make a room feel larger? Add windows! This loft in Amsterdam feels twice as large as it really is thanks to a slanted window-filled ceiling that lets in a ton of natural light and provides an expanded view of the sky. Can you imagine falling asleep there? See more pictures from the loft on C-More. 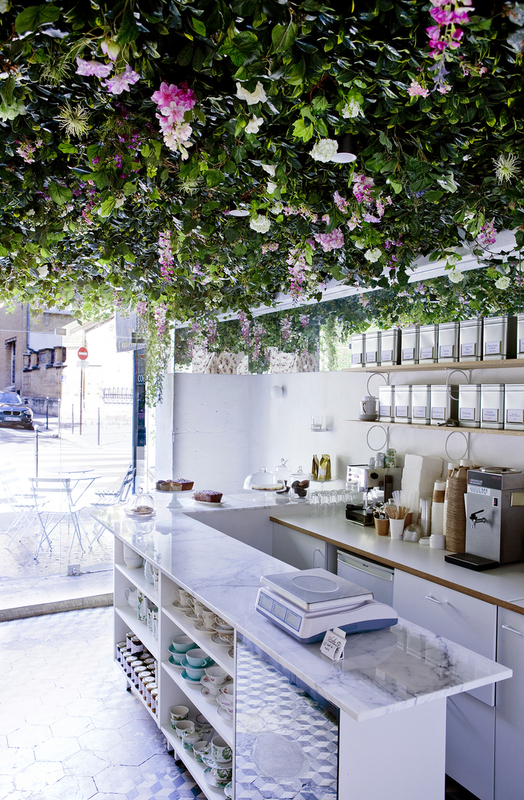 How romantic would it be to eat under a lush ceiling of hanging flowering plants? The gorgeous ceiling featured here was design by Marie Deroudilhe (shared on Knstrct) for a small Paris café called Lily of the Valley. This ceiling is more for an outdoor living space than it is for an interior area. It would be a pain to have to constantly cleanup leaves and petals discarded by the plants above, but would be absolutely wonderful for an outdoor sanctuary that just needs a quick sweep. 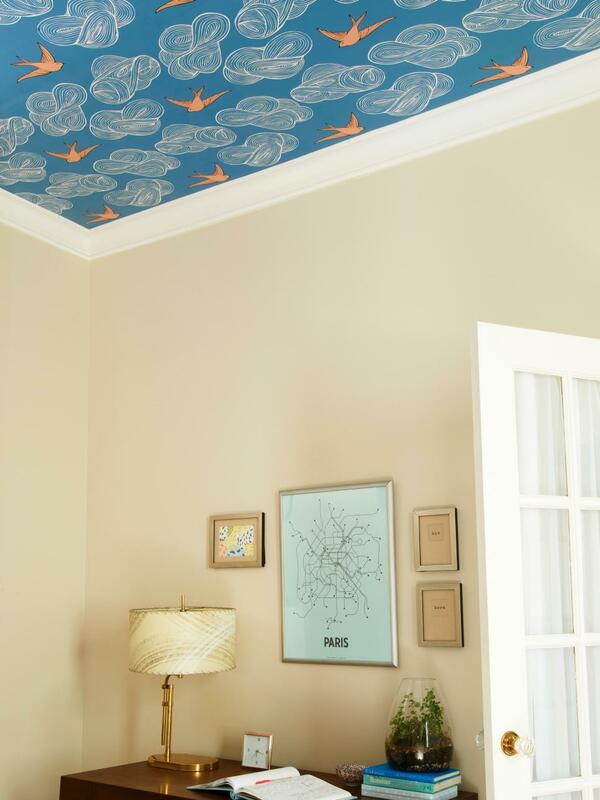 Have you seen an awesome ceiling that could be adapted to a home? Share it in the comments!